The Village of South Lebanon turned to Childress & Cunningham’s expertise in adaptive reuse to transform a former elementary school building into their municipal office building. The Village’s desire for a practical and cost-effective remodeling included exterior improvements to change the building’s character, as well as improved ease of access for those with disabilities. New full-height windows replaced the previous glass-block transoms throughout, and a new vestibule entry with stately columns creates an airlock. A circular plaza of Indiana limestone includes accessible ramps defined by brick walls and planters. The plaza centers on the new entry and creates a presence on both streets and the soon-to-be-built park. Inside, new finishes conceal additional cavity insulation along exterior walls to give a clean look and improved energy efficiency. Ceilings include soffits and raised coffers to work with a new HVAC system, which was designed and installed ahead of other work through a prior State of Ohio contract. A large restroom was added to the first floor to create accessible Men’s and Women’s rooms on the same floor, with all new tile floor and wall finishes for both. The Council Chambers room was planned with a raised platform sized to fit the Village’s existing desk furniture. 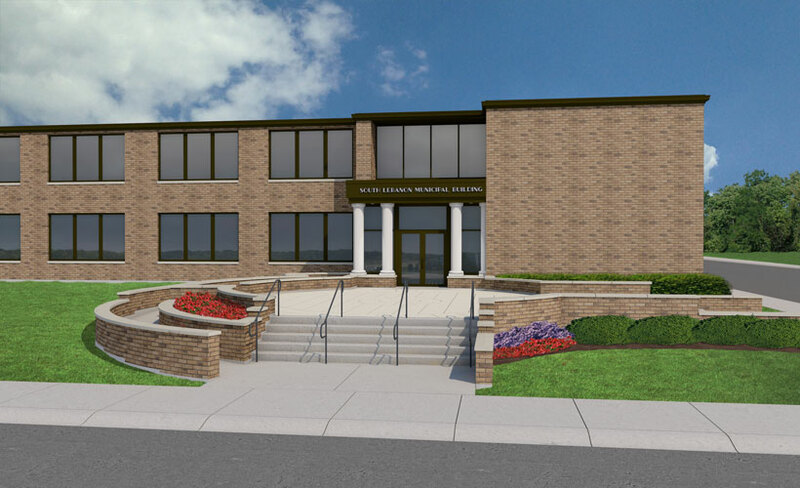 By taking stock of what this building has to offer and committing their budget to the most effective upgrades, this new municipal building will become a significant asset for South Lebanon! Posted in Community Leadership / Involvement Energy Efficiency Government/Municipality .